This brightly illustrated book is aimed at junior/intermediate readers (grades 3 – 7). The concept is fairly simple: have students keep track of the contents of their lunches for a week and then thoroughly investigate the results. The author promises you will probably find “prehistoric nomads, ancient tombs, explorers’ ships, and maybe even a little mad science.” In the chapters that follow—by analyzing a week’s worth of typical meals—we learn of the lunch contributions of, among others, the fourth Earl of Sandwich, Aztec tomato growers, and even Kalahari watermelon cultivators. Other sections describe the science behind ergot poisoning, explain why salt is crucial to creating ice cream, and list the “mystery” ingredients that might lurk in hot dogs. This work includes hundreds of amusing illustrations, two pages of essential sources, along with suggestions for further reading and an index. 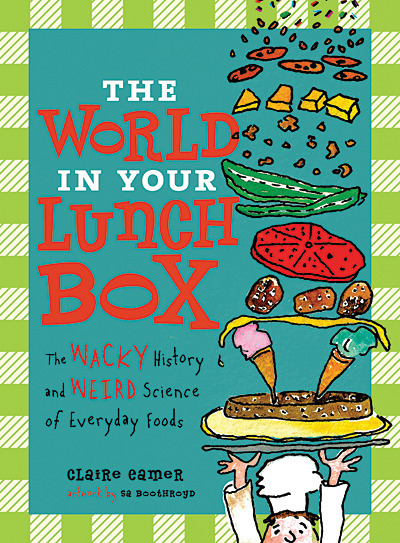 Classroom Connections: With its fun-filled, fact-based text and “lunch laugh” corny joke sidebars, The World In Your Lunch Box is an entertaining combination of Science, Social Studies and Health topics. A teacher could have students record what they eat, and then investigate further what is in an average meal. Healthy eating is one of the topics covered in the Healthy Living strand of the provincial elementary curricula; this book would help to address prescribed learning outcomes in an engaging way. This review is from Canadian Teacher Magazine’s Apr/May 2014 issue.